Worthing incorporates two mediaeval parishes, Broadwater and West Tarring. 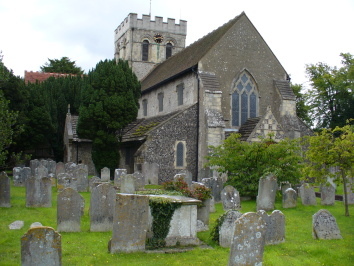 West Tarring had two chapelries, Heene and Durrington, which lasted until the C18. Worthing itself was a hamlet in Broadwater parish and its chapel had gone by the early C17. The churches and Heene and Durrington chapels, were inland, probably because of coastal erosion, which caused much poverty and was a major factor in the disappearance of the chapels. Worthing became a resort later than Brighton and the stay of Princess Amelia, daughter of George III, in 1798 was decisive. Over the next 30 years the population increased to nearly 4000. A resort was planned round spacious gardens, later built over. In 1812 a chapel, St Paul, was built and a second one further inland, Christ Church, started in 1841. The town expanded in both directions along the coast and churches were built, included St George (1868), Holy Trinity (1882) and the new Heene in 1873. Unusually for Sussex resorts, all were evangelical. Pressure for a further one to cater for guests with ritualist sympathies came largely from the holiday trade as the lack was felt to deter such people. The existing clergy resisted, both because of the effect on existing congregations and feelings against ritualism. It required the bishop’s intervention for St Andrew to be opened (1886-88). The town expanded further along the coast to meet Goring and Sompting, both today suburbs. Later churches included St Matthew (1899) and St John, West Worthing (1900, rebuilt 1936). Inland, the parishes of Broadwater and West Tarring were absorbed by 1900 and after 1920 housing spread into that of Findon. Most of the churches and chapels were very modest, like St Peter, High Salvington. Others have not survived or were rebuilt. Emmanuel (1911, rebuilt 1976 and since demolished) was almost the only post-war one. There has also been a considerable reduction in the number of parishes. St Paul and Holy Trinity have been made redundant and others have been threatened with the same fate.